Lanvin pants in solid weave. Zipper cuffs with exposed taping. Concealed tab/zip front; belt loops. AG Adrian Goldschmied "Graduate" fit jeans in linen-blend denim. Five-pocket style; signature stitching on back pockets. Leather logo patch at back waist. Fading and whiskering through legs. Relaxed waistline; slim-straight fit. Button/zip fly; belt loops. Linen/cotton. Made in Japan. 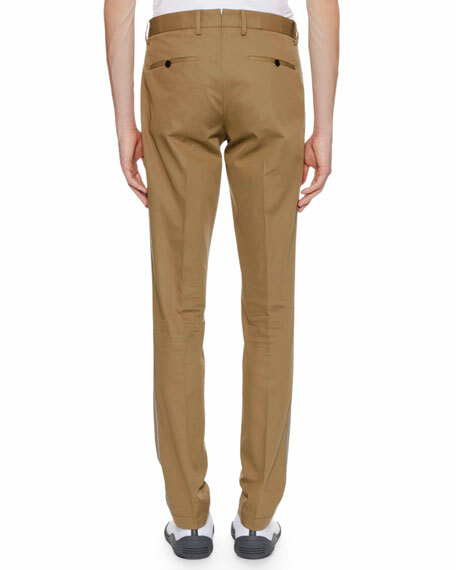 EXCLUSIVELY AT NEIMAN MARCUS Brioni twill pants. Five-pocket style. Mid rise. Slim fit; straight legs. Button/zip fly; belt loops. Cotton/spandex. 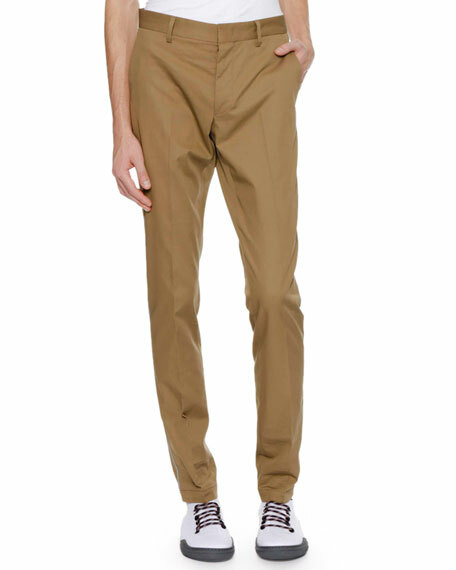 EXCLUSIVELY AT NEIMAN MARCUS Brioni twill pants. Five-pocket style. Mid rise. Slim fit; straight legs. Button/zip fly; belt loops. Cotton/spandex. Made in Italy. Model's measurements: Height, 6'1"/185cm, waist 30"/76cm, suit 38R, shirt 14.5x34, inseam 34"/86cm. Ermenegildo Zegna chino trousers. Quarter top pockets; back welt pockets. Flat front. Slim fit; straight leg. Button/zip front; belt loops. Ermenegildo Zegna chino trousers. Quarter top pockets; back welt pockets. Flat front. Slim fit; straight leg. Button/zip front; belt loops. Cotton/spandex. Pocket lining: cotton. Made in Romania. Model's measurements: Height, 6'1"/185cm, waist 32"/81cm, suit 40L, shirt 15x34, inseam 32"/81cm. Ermenegildo Zegna jeans in stretch-canvas twill. Five-pocket style. Slim fit through straight legs. Button/zip fly; belt loops. Cotton/spandex. Cotton lining. Ermenegildo Zegna jeans in stretch-canvas twill. Five-pocket style. Slim fit through straight legs. Button/zip fly; belt loops. Cotton/spandex. Cotton lining. Leather trim. Made in Romania. Model's measurements: Height, 6'1"/185cm, waist 31"/79cm, suit 40, shirt 15.5x35, inseam 32"/81cm.